The Canucks had the league’s leading point scorer in Henrik Sedin, their highest scorer in Alexandre Burrows, the Olympic gold-medal winning goalie in Roberto Luongo, the Olympics’ highest scorer in Pavol Demitra, the best player from the US Olympic team in Ryan Kesler and one of the highest plus/minus players throughout the regular season in Christian Ehrhoff. The playoffs feature a completely different brand of hockey than the regular season, and even the Olympics. How many fancy between-the-legs passes from one Sedin to the other did you see in the playoffs? How many pretty, four-player plays did you see? How many precision cycles? These are all nice things, and certainly entertaining during the regular season, but they do not win playoff hockey. Likewise, Roberto Luongo is a fine goalie for ordinary games. But when the pressure is really on, Luongo loses focus. The Olympics were taken as validation that Luongo can play, and win, the big games. But really, it wasn’t Luongo that won the gold medal for Canada so much as it was the rest of the players that won it. Luongo played just good enough (but not exceptionally) to allow the players to win. Chicago’s Antti Niemi was, on the other hand, good enough (but not exceptional) to allow his players to win. Chicago’s players were, quite clearly, superior to the Canucks. Alexandre Burrows, Pavol Demitra and Ryan Kesler were invisible, not only in this round against Chicago, but during the Canucks’ entire playoff run. Burrows, with 35 goals during the regular season, managed just three goals, two of which were empty-netters. Kesler scored just once in 12 games, Demitra scored twice, and there were ten players in the playoffs who put up more points than regular season leader Henrik Sedin. Christian Ehrhoff was a mere plus one. For the three games in Chicago, two of which the Canucks won, the Blackhawks had last line change (as the home team always does). When Vancouver had last change for their three home games, they lost. Perhaps Canucks’ coach Alain Vigneault ought to have matched up lines according to Blackhawks’ coach Joel Quenville’s designs. The Blackhawks were, quite obviously, the better, hungrier team. They expected to win, and already had their bags packed for the next round against San Jose. The Canucks, on the other hand, played like they did not quite realize that the entire year, and perhaps their individual careers, were at stake. They deserved to lose tonight. And this series. The San Jose Sharks, the league-leading and highest-scoring team in the NHL, visited the Vancouver Canucks Sunday, November 29, 2009. The game was something of a lackluster affair, with the Canucks looking tired, having played the Edmonton Oilers Saturday, and the Sharks doing everything they could to slow down play. Vancouver scored early on a goal by Kyle Wellwood (just his second of the season) at the 1:52 mark of the first period. Wellwood broke in on a two-on-one with Tanner Glass, after a great feed by Steve Bernier, and put the puck in off the far post with a perfectly placed wrist shot. The Sharks, however, replied some ten minutes later, with Frazer McLaren scoring his first NHL goal on a cleverly redirected centering feed from the boards to Roberto Luongo’s right. McLaren scored from just outside goalie Roberto Luongo’s blue paint. San Jose added another goal in the second period, this one coming on the power play when Dan Boyle put in a rebound surrendered by Luongo on a shot by Joe Thornton. The Sharks dominated the period, out-shooting the Canucks 15-4, and the second frame ended with the Sharks leading two to one. Cue the Canucks’ comeback – they’ve outscored opponents heavily in third period play this season. Alas, that was not to be. Despite out-shooting San Jose 13-8 in the third period, it was the Sharks who scored twice. Manny Malhotra scored his fifth of the season after finding himself wide open in front of the net and putting a nice backhand move on Roberto Luongo, sliding the puck between the Canucks’ goaltender’s pads. That goal came with just two minutes and thirty-five seconds left in the third period. Thirteen seconds later, the San Jose Sharks struck again. This time Jamie McGinn raced into an opening directly in front of Luongo in time to put a weak backhand behind the star goalie. With the score four to one, and with just over two minutes left in the third period, Vancouver tried to mount a comeback – no easy feat against this San Jose team. The Canucks finally put another puck past Sharks’ goalie Evgeni Nabokov when Jannick Hansen redirected a Kyle Wellwood pass from the face-off circle into the net while diving for the puck in the slot. 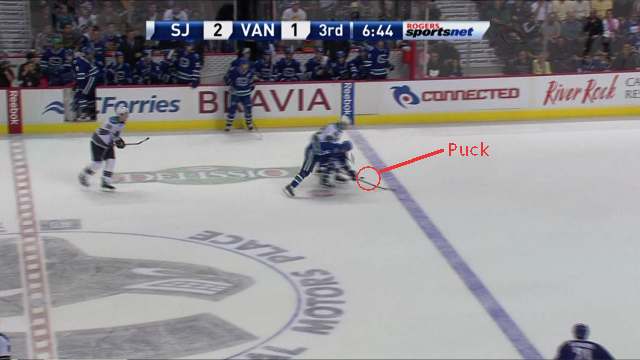 Unfortunately for Canucks fans, Hansen’s goal came with only seven seconds left. The game ended in a four to two victory for the visiting San Jose Sharks. The turning point in the Canucks’ comeback attempt seemed to come on a particularly poor non-call by the linesmen, as the Sharks brought the puck into the Canucks’ zone with 6:44 left in the third. The play was clearly offside, and not by a little – a Sharks player (Joe Thornton) was trying to get out of the Canucks’ zone and was at least eight feet inside that zone when the Sharks Patrick Marleau brought the puck over the blue line. To top it off, Canuck winger Alex Burrows was called for a hooking penalty on the play – a play which should have been dead as soon as the puck crossed the blue line. At the very least, it took two crucial minutes away from a possible Canucks comeback while they killed off (successfully) the penalty. It seemed to do more than that, however, shifting momentum squarely to the Sharks. See the photos below. In the first frame, the puck is approaching the blue line on the stick of Patrick Marleau. In the second frame, the puck is being brought across the blue line, and the stick of the San Jose player (Joe Thornton) is visible on the far right, nearly out of camera range (that’s how far offside this play was). 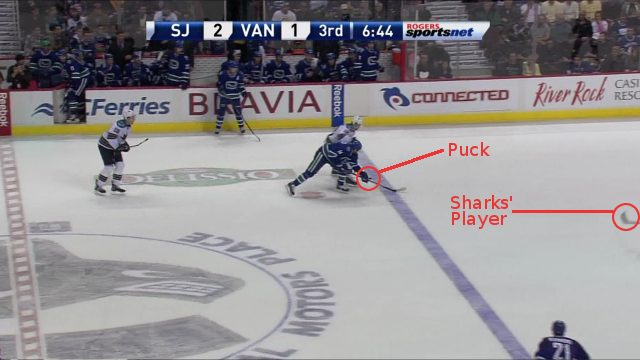 In the third frame, the puck has been brought across the blue line and the Sharks’ player is clearly visible well inside the Vancouver zone. Burrows has yet to be called for the holding penalty at this point. Sharks' Patrick Marleau carries puck toward Canucks' blue line. As Marleau brings the puck across the Canucks' blue line, the Sharks' Joe Thornton's stick is visible, to far right of frame. Yes, the play was that far offside. Puck has now crossed line, and offside Sharks' player (Joe Thornton) is clearly visible at least eight feet inside Canucks' zone. Vancouver Canucks Peaking at the Right Time? In the extremely tight Western Conference (where a mere fourteen points separate twelth place from third place), it might seem difficult to pick a team to emerge from the fray victorious and represent the Western Conference in the Stanley Cup Final. The Detroit Red Wings, of course, are perennial favourites (although their defense (and particularly goaltending) looks rather suspect, with five of the other eight seeded teams showing fewer goals against). But what about the teams immediately below Detroit in the standings, notably the San Jose Sharks, the Calgary Flames, the Vancouver Canucks and the Chicago Blackhawks? Points don’t tell the whole story: the Sharks, for example, piled up a ton of points early in the season, but have been struggling of late. Let’s instead take a look at these respective teams’ trending. Let’s look a bit more closely at the trending: if we plot each of these teams’ point accumulation over time, one game at a time, and add some regression lines, what does that tell us about where these teams are heading? 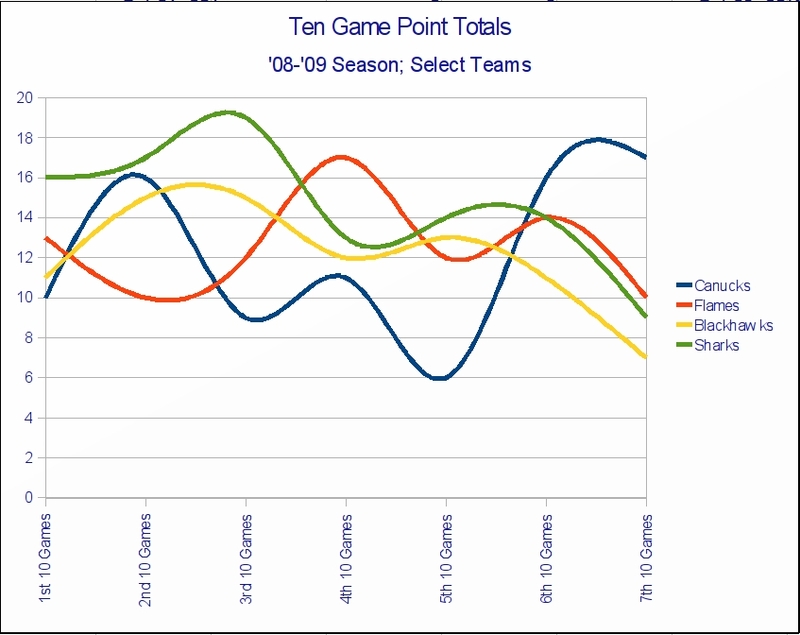 Interesting: as we can see, the Sharks are on a downward trend, as are the Blackhaws. The Flames, meanwhile, are trending upward, but not as much as the Canucks. 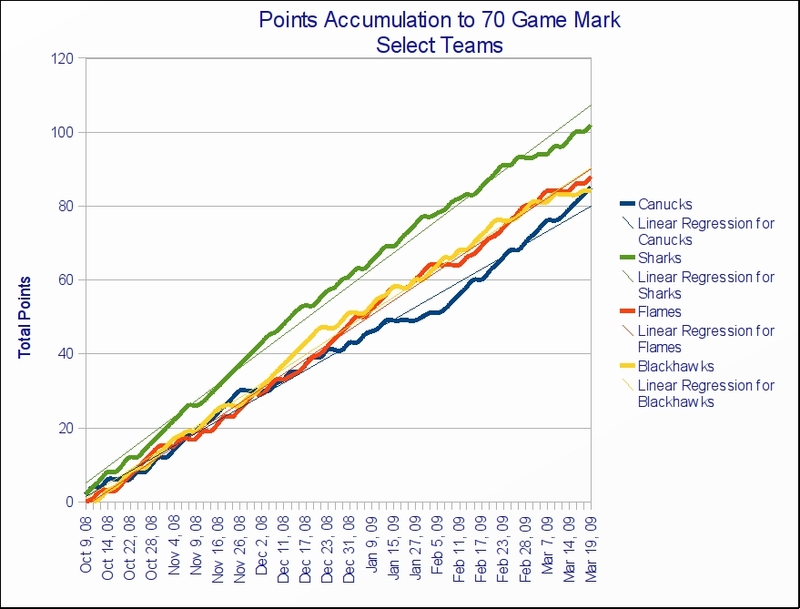 This shows an even starker constrast between the four teams: the Canucks have clearly been firing on all cylinders over the past 20 games, while the other three teams are showing the wear and tear of a long season of high-calibre hockey. Our conclusion? Look for Vancouver to go deep into the playoffs this year. Detroit has managed to outscore opponents and win games despite a leaky defense; that style of hockey historically doesn’t work in the tighter, lower-scoring and more defense-oriented post-season. Calgary remains a force, however San Jose and Chicago appear to be running out of steam at exactly the wrong time of the season. The Vancouver Canucks beat the Nashville Predators 3 – 1 in a hard-fought game Tuesday, December 9th. Vancouver opened the scoring at the 8:35 mark of the first period with an even-strength goal by Pavol Dimitra, his eighth of the campaign. After Nashville’s fourth line iced the puck, Vancouver kept the puck in the Predator’s end despite losing the subsequent face-off. After a battle for the puck near the blue line on the left side boards, Kyle Wellwood gained control of the puck and skated through the right face-off circle, carrying the puck and making moves that left Predator’s defender Kevin Klein flat-footed before sending a perfect, laser-like pass to Dimitra, who simply shot the puck into a wide-open net. The Predators, however, answered back quickly, scoring just two minutes and twenty-eight seconds later on a power-play goal by Radek Bonk. Bonk was left alone at the top of the goal crease and slid the puck under Canucks’ goaltender Curtis Sanford after a nice feed from Martin Erat. Bonk’s goal was just his second of the season. Nashville managed to kill off a rare seven-minute Vancouver power-play in the second period, and it looked as if the momentum might shift in Nashville’s favor after the successful penalty kill, however the period closed with the teams still tied at one apiece. The Vancouver Canucks entered the third period once again on the power play, this time a four-on-three advantage. Vancouver defenseman Alex Edler converted an incredible pass from Henrik Sedin just twenty-four seconds into the period. Sedin sent a blind, behind-the-back pass as he was falling after being cross-checked at the left of Predator’s goalie Dan Ellis. Sedin’s pass perfectly hit the wide open Edler near the bottom of the right face off circle. 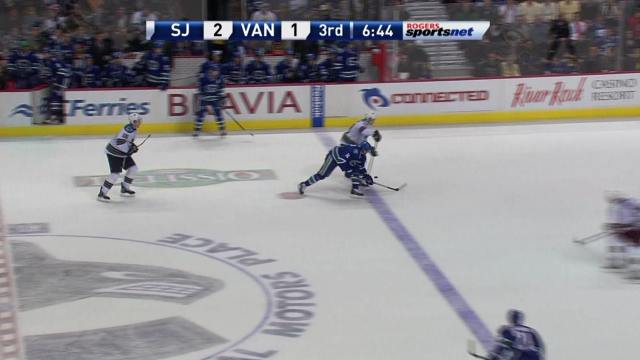 Like Dimitra in the first period, Edler had a wide-open net to shoot at, and he didn’t miss. Alexandre Burrows capped the scoring with an empty net goal at 19:16 of the third, after some hard work by line mate Ryan Kessler to gain control of the puck at the Predator’s blue line. The game featured some bone-crushing hits: first Vancouver’s Matthias Ohlund leveled Radek Bonk in full flight at the Canucks’ blue line. Then Vancouver’s Rob Davison flattened Scott Nichol in front of the Vancouver bench. Nichol seemed woozy after the hit, and a melee broke out immediately. Davison had so much momentum when he hit Nichol that Davison ended up mostly in the Canuck’s bench after the hit. Vancouver’s Jason Jaffrey fought Nashville’s Rich Paverley to a draw in the ensuing brouhaha. Nichol, meanwhile, headed straight to the dressing room. Alexandre Burrows of the Canucks left his feet to level J.P. Dumont, resulting in another fight, as Jason Arnott took on Burrows. Dumont was slow to get up. Later, Vancouver’s Ryan Kessler nailed Shea Weber into the corner boards, and yet another dog pile ensued. It was the Canucks’ second win in a row and netted the team five out of a possible six points in their previous three games, after starting their seven-game road trip with three straight losses. The Vancouver Canucks next play the Edmonton Oilers Saturday, December 13th at 7pm PST. The Vancouver Canucks faced the Colorado Avalanche Sunday, December 7, 2008. Vancouver came into the game having bested Minnesota 2 – 1 on Friday, ending a four-game losing streak and attempting to salvage a gruelling seven game road swing. Colorado, meanwhile, also played Friday, having lost to Dallas 2 – 1 in a shootout. The game was a spirited affair, with the lead swinging between the teams. Ultimately, the game was decided on a shootout. Rookie goaltender Cory Schneider was unable to stop any of the three Avalanche shooters (Woitek; Marek; Milan), while Pavol Dimitra, the Canucks’ second shooter, was easily stopped by Colorado goalie Peter Budaj (Wellwood scored as Vancouver’s first shooter). That made a third Canucks’ shooter unnecessary. The story of the game, however, was the emergence of Steve Bernier. Much maligned among Vancouver fans, Bernier’s season to date featured a series of missed scoring opportunities, many of them of the “give me” variety: wide-open nets on smart feeds from his line mates. As the missed chances piled up, it seemed clear Bernier’s confidence was getting shaky – this, after all, is a player who had no problem piling up the points in the Junior and Minor leagues: he totalled 313 points in just 272 games in the Quebec Major Junior Hockey League, including 49 goals and 52 assists for 101 points in 71 games in the 2002 – 2003 season. In Vancouver, however, it just wasn’t clicking. Bernier had just a single assist in the five games heading into the game against Colorado. What a difference a game makes. Against the Avalanche tonight, Steve Bernier scored on the power play 17:45 into the second period, poking home a puck sitting idly behind Budaj. It was the sort of “give me” goal Bernier almost surely would have found a way to miss earlier this season. Then, at 9:57 of the third, Bernier found some open ice in the slot and wristed a great feed from the corner from Alex Burrows for his second of the game. Bernier’s increased confidence level was obvious after that – later in the third he made a great move, coming down the right wing with speed, then going inside on the Colorado defenseman, skating directly into the slot before firing a backhand off the post. The puck didn’t go in, and Bernier didn’t get his first career hat trick, but it seemed a move he wouldn’t have thought of attempting prior to the pair of goals he scored tonight. It’s just one game. But for the Vancouver Canucks, the emergence of Steve Bernier as a reliable contributor to the team’s offense would open an entirely new dimension to their game, much as Ryan Kessler’s emergence as a true, two-way power forward has done. The Canucks next visit the Nashville Predators, 5pm PST, Tuesday December 9. The game will be broadcast on Sportsnet Pacific, and is available in HD. Sundin to the Vancouver Canucks = Messier Era Revisited? When we heard of rookie Vancouver Canucks’ GM Mike Gillis’ offer of $20MM for Mats Sundin over a two-year deal, we immediately thought, “oh no, here we go again!”. The similarities to the Mark Messier fiasco of ’97-’00 were uncanny: in both cases the player involved was in the twilight of his career, in his late thirties, verging on retirement. Even the $20MM figure is the same (although in Mr. Messier’s case, the sum was spread over three long, unproductive and frustrating years, rather than the two being offered Mats Sundin (a one year deal is also on the table)). You may recall Mr. Messier’s tenure with the Canucks: during his three years with Vancouver, the team failed to make the playoffs, the locker room was filled with turmoil and the team started bleeding money in an otherwise hockey-mad city. Then again, like us, you may have simply blocked it out of your memory. Mr. Messier, who played 25 seasons in the NHL, posted his 21st, 20th and 18th worst seasons, respectively, during his three years with the Vancouver Canucks (as measured on an average points-per-game basis). Had he retired at the end of those dismal years, they would have been the worst years of his career (excluding his first season in the NHL). Fortunately, he peddled his dimishing services another four years to the New York Rangers (promising fans a playoff berth upon his signing there; alas, the Rangers went without a ticket to the dance for each of his final four years as Captain). Mark Messier's three seasons with the Vancouver Canucks were among the worst in his career. We’re hearing the same talk of Mr. Sundin’s leadership that we heard in the days before Mr. Messier was signed: Mats Sundin will bring the leadership, both on and off the ice, necessary to take the Canucks all the way to the Stanley Cup. Mark Messier has built quite a fiction around his supposed leadership abilities. In point of fact, during his final seven seasons, he was unable to lead his teams into the playoffs, let alone get anywhere near the Stanley Cup. So, should we expect a repeat, another two seasons in the hockey wilderness, should Mats Sundin sign with Vancouver’s Canucks? There’s reason to think not. Unlike Mark Messier, Mr. Sundin seems to be improving with age: a look at his stats gives lie to the notion he’s in the twilight of his career. During his past three seasons with the hapless Toronto Maple Leafs, Mr. Sundin has posted the 3rd, 6th and 5th best numbers, respectively, of his 17 NHL seasons (again, on an average points-per-game basis). This coming not on a team with the likes of Alexander Mogilny and Pavel Bure in their prime (as Mr. Messier enjoyed (simultaneously!) while in Vancouver), but rather with a cast of teammates you’ll never see on a Hall of Fame ballot. In fact, if there’s one thing the Toronto Maple Leafs have excelled at since the storied days of Darryl Sittler, Börje Salming and Mike Palmateer, it’s assembling a roster of players that produce the odd situation of the sum being less than its parts. Unlike Messier, Mats Sundin appears to be improving with age. Whether Mats Sundin will land in Vancouver (and get a shot at the once-in-a-lifetime chance to captain his country’s team on his home team’s rink in Vancouver’s 2010 Olympics) is something only Mr. Sundin is privy to at this point (Swedish media published a since-discredited report that he has joined the Cancuks). However if Mats Sundin does indeed sign with the Vancouver Canucks, there’s reason to hold out hope that his tenure in Vancouver will differ significantly from Mark Messier’s. For Canucks’ fans, that’s a very good thing indeed. Jerome Iginla, the Calgary Flames Captain (30, and playing in his 11th NHL season), has, for the second time in his career, scored 50 goals in a season. His final (and 50th) goal came against the Vancouver Canucks in the last game of the season Saturday, April 5th, 2008. Iginla also managed 48 assists on the season, bringing his point total to 98, a career high. The Vancouver Canucks, meanwhile, are captained by Markus Naslund (34; 14th season), who finished the 2007-2008 campaign with 25 goals and 30 assists for a total of 55 points – his lowest total in ten years. Both captains used to appear together in Nike commercials, and both have been elite players in the NHL. In fact, their numbers were virtually identical until recently. However Iginla is off to the Stanley Cup Playoffs; Naslund is just…off, his Vancouver Canucks having been eliminated from the Playoffs prior to the season ending match up between the Flames and the Canucks (which could have been one hell of a winner-take-all battle for the final playoff spot if things had worked out just ever so slightly differently (read: if the Canucks had bothered showing up for any one of the six games they lost in their final seven games of the season)).